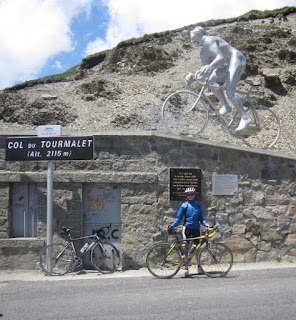 Read an earlier post with more images and a story of riding up the Col du Tourmalet titled Today I saw the Tourmalet bring a man to tears. There is a souvenir shop at the top of the Col du Tourmalet that sells bike jerseys, cow bells, hats, trinkets. But you have to carry whatever you buy, down in your jersey pocket. Be sure to stop and have a drink in (or on the patio!) of the restaurant at the top of the pass. If the weather is good, the scenery and atmosphere of cyclists coming and going is great. Also there is a great collection of cycling memorabilia inside the restaurant.